Thankfully, there were more civilized and educated people in earlier centuries who seemed proud to describe their local history. 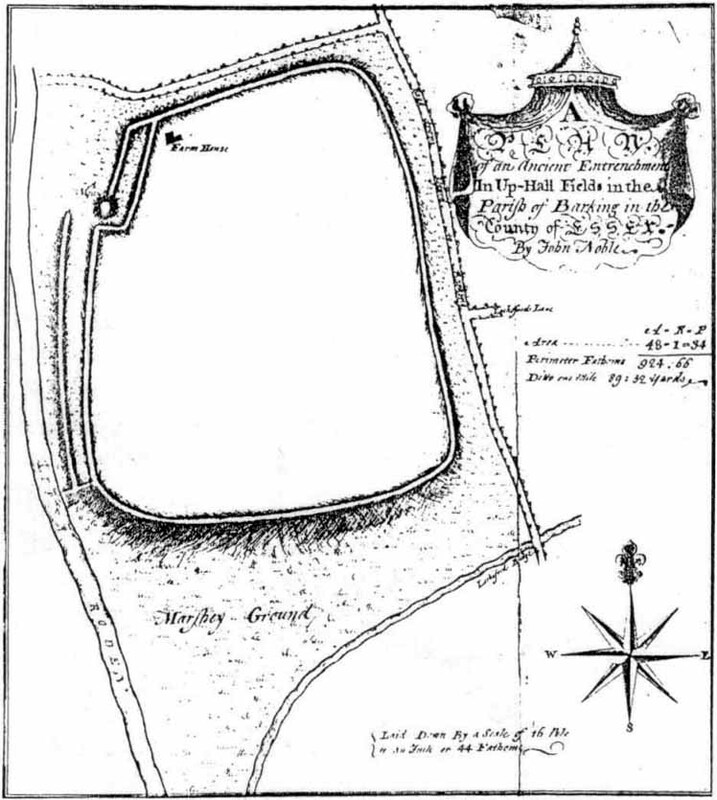 Early literary accounts seem sparse; although in Mr Wright’s (1831) huge commentary to Philip Morant’s (1768) Antiquities of Essex, he thought that the adjoining parish of Barking—whose ancient boundary line is marked here by the southern embankments of the enclosure—derived from the Saxon words burgh-ing, which he transcribed as ‘the fortress in the meadow’. The same derivation was propounded in Richard Gough’s 1789 edition of Camden’s Britannia, from the “Fortification in the meadows.” It seems a more reasonable derivation than that ascribed in the Oxford Names Companion (2002) as the “(settlement of) the family or followers of a man called *Berica” (the asterisk here denotes the fact that no personal name of this form has ever been found and is pure guesswork). But according to the English Place-Name Society text on Essex by Paul Reaney (1935), the early spellings of Barking implies a derivation from ‘birch trees.’ Anyway…. But this is a spurious allusion; albeit an understandable one when one recognizes that the paradigm amongst many writers at the time was to say that anything large and impressive was either a construction of the Romans or the Danes, as the early British—it was deemed—were incapable of building such huge monuments. How wrong they were! 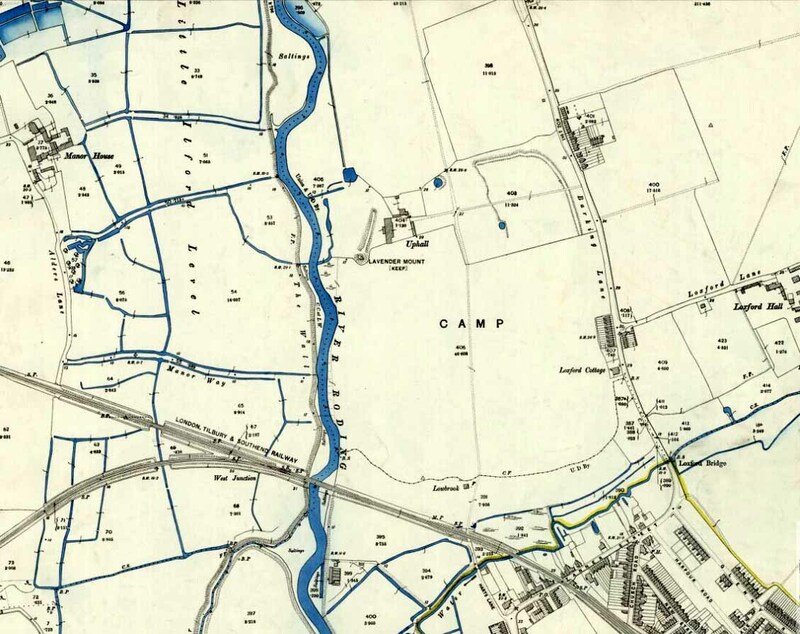 “the remaining earthworks consist of a short length of rampart with an irregularly shaped mound at the north end, which is known locally as Lavender Mount, and another short length north of the farmhouse; there are also traces of the east side of the camp running parallel with Barking Lane. An early plan shows part of the north and east sides of the earthwork and suggests that it was roughly rectangular in outline. In 1750 the north, east and south sides are said to have had a single trench, and the west side a double trench and bank. The ‘Lavender Mount’ aspect in this monument, seemed a peculiar oddity. Even modern archaeologists aren’t sure of what it might have been, erring on the side of caution with interpretations saying it was a keep of some sort, or a small beacon hill. It might have been of course; but if it was a beacon hill, there would very likely be some written account of it – but none exist as far as I’m aware. Initial impressions when just looking at the images is that it was a tumulus, but the position of the mound on top of the raised earthen embankments tells us that it was constructed after the Iron Age ramparts. Writers of the Victoria County History (1903) said the same, suggesting a Saxon or more likely Danish origin. The area around Lavender Hill was eventually explored by archaeologists in 1960, and several times thereafter – and what they uncovered showed us a continuity of usage that spanned several thousand years! “The settlement, judging from the relatively small area of the fortification actually excavated, was laid out in a regular way. As might be expected, the round-houses appear to be aligned, indicating some sort of street-pattern. ‘Four-poster’ structures have been located in particular areas, again pointing to some sort of designation of special zones of activity. Large quantities of charred grain from the post-pits and surroundings would confirm that these structures are granaries…. I could just copy and paste the rest of Greenwood’s report here, but it’s quite extensive and interested readers should refer to her own account in the London Archaeologist . It’s a pity that it’s been destroyed. 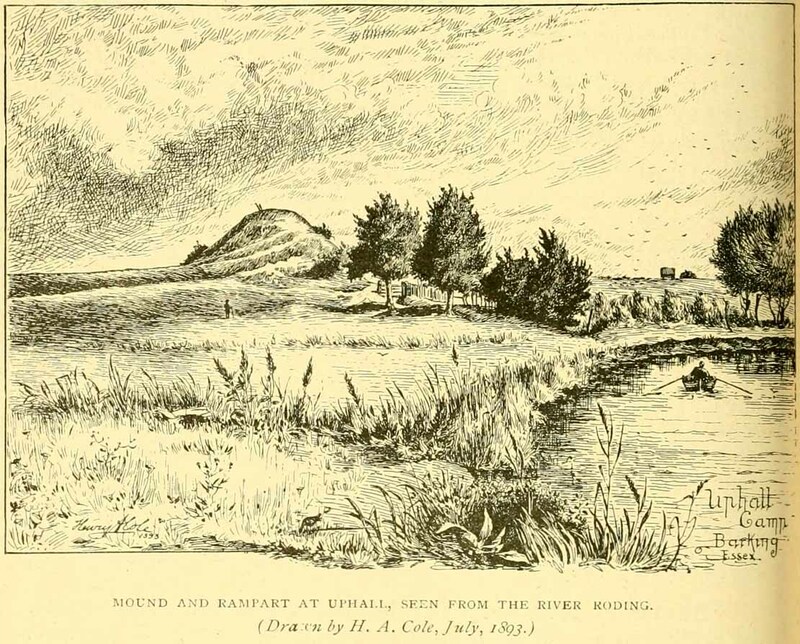 Crouch, Walter, “Ancient Entrenchments at Uphall, near Barking, Essex,” in Essex Naturalist, volume 7, 1887. 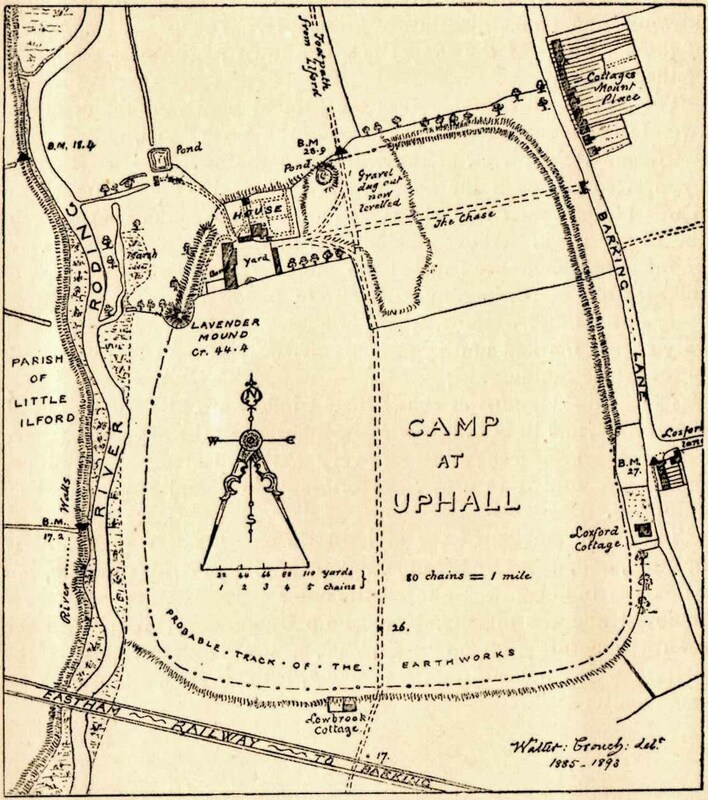 Crouch, Walter, “Uphall Camp,” in Transactions of the Essex Archaeological Society, volume 9 (New Series), 1906. Doubleday, H.A. & Page, William (eds. ), Victoria History of the County of Essex – volume 1, Archibald Constable: Westminster 1903. 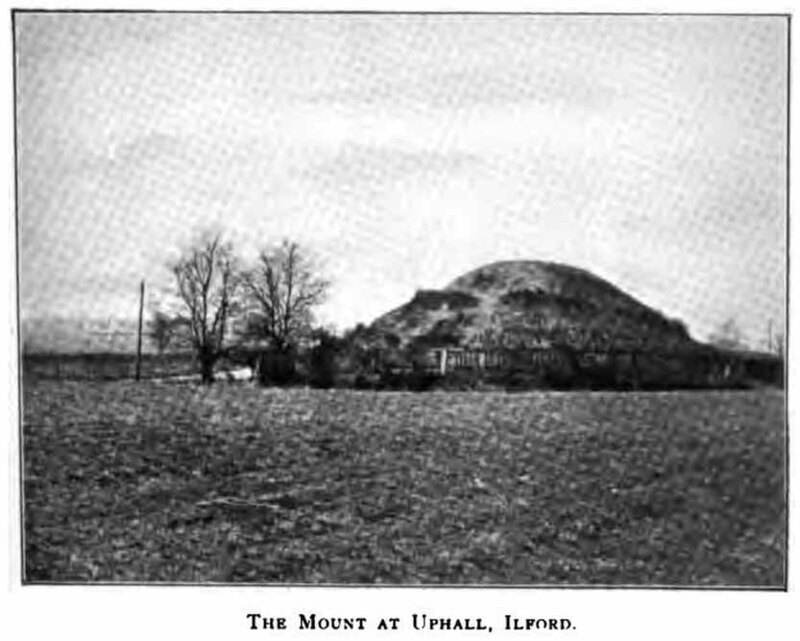 Greenwood, Pamela, “Uphall Camp,” in Essex Archaeology & History News, 1987. Greenwood, Pamela, “Uphall Camp, Ilford, Essex,” in London Archaeologist, volume 6, 1989. Hogg, A.H.A., British Hill-Forts: An Index, BAR: Oxford 1979. Kemble, James, Prehistoric and Roman Essex, History Press: Stroud 2009. Lysons, Daniel, The Environs of London – volume 4, T. Cadell: London 1796. Millward, Jonathan, London Borough of Redbridge: Archaeological Priority Areas Appraisal, Oxford Archaeology 2016. Morant, Philip, The History and Antiquities of Essex – volume 1, T.Osborne: London 1768. 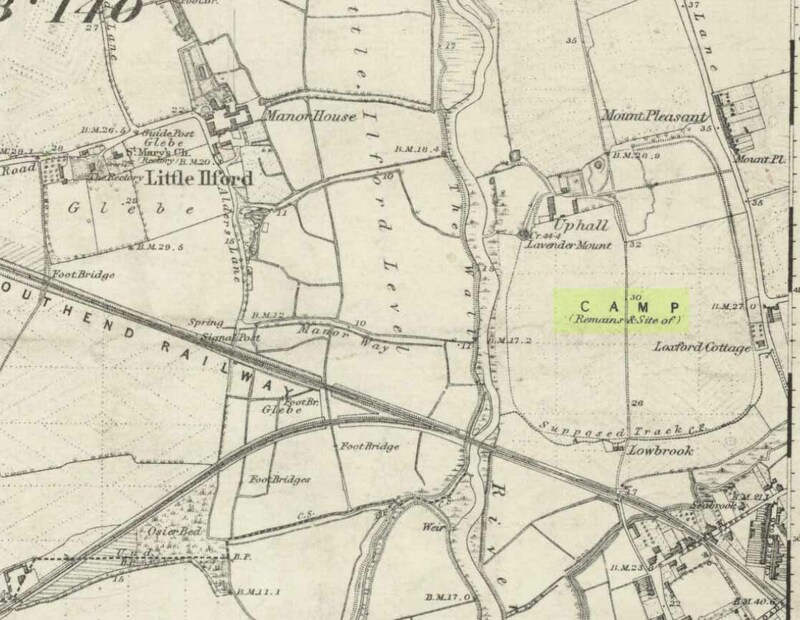 Norris, F.J., “Uphall Camp”, in Gentleman’s Magazine, 1888. Ogborne, Elizabeth, The History of Essex, Longmans: London 1814. Royal Commission Ancient & Historical Monuments, England, An Inventory of the Historical Monuments in Essex – volume 2, HMSO: London 1921. Tuck, Edward, A Sketch of Ancient Barking, Its Abbey, and Ilford, Wilson & Whitworth: Barking 1899. 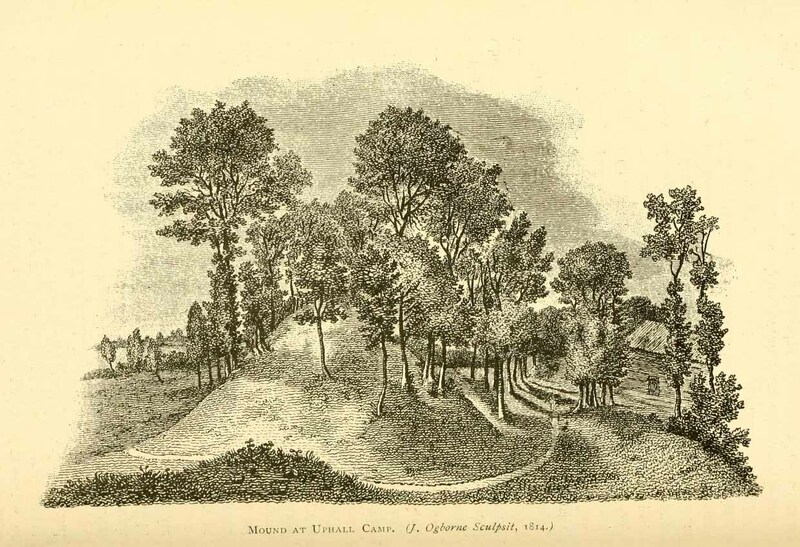 Wilkinson, P.M., “Uphall Camp,” in Essex Archaeology & History, volume 10, 1979. Wright, Thomas & Bartlett, W., The History and Topography of the County of Essex – volume 2, G. Virtue: London 1831. This entry was posted in England (south), Essex, Settlement/Enclosures and tagged ancient sites, antiquarian, antiquities, Archaeology, Barking, Bronze Age, camps, earth mysteries, East Ham, enclosures, english heritage, Essex, Hillforts, Ilford, Iron Age, London, neolithic, prehistoric camps, prehistoric sites, Redbridge, Romano-British, Romans, sacred sites, settlements. Bookmark the permalink. Has absolutely all trace of the camp been obliterated?